Here’s my latest contribution to the self-portrait marathon. In case you missed the earlier ones in my series, here is the the first self-portrait, the second, the third, the fourth. View the fantastic slide-show of the participants’ portraits, for which we must give Sparky a huge thank you! And, the marathon is still going strong until July 8th so it’s not too late to join in the fun! Thanks Erika, I don’t know beautiful, but interesting. 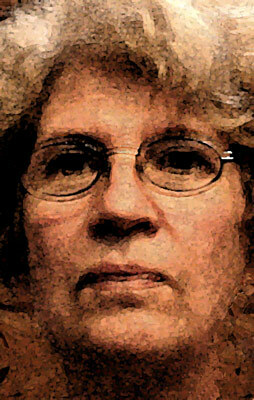 It was fun to take the photo I took of myself in the mirror and play with it in PhotoShop. Good bones you have. This is a fine study. In fact, all in all, I’d really rather draw you! That’s the first comment I’ve had about my bones 🙂 Heh. Thanks Anna, I think you did a super job of your own self-portrait. You know, it just struck me how much I look like my father here!